I find it puzzling that not everybody knows that electronic charts used in combination with a good electronic chartplotter, can do everything that a paper charts allows you too, plus more. I was in a situation last summer where I could not find a bridge clearance on my electronic chart system. I searched and searched, but the data just wasn't there. Finally had to haul out the paper chart, where the clearance was contained in one of the notes. yes, bridges and stuff. Especially when making a point of traditional navigation, you should use an almanac for that info. In many countries you must have the official almanac or you'll be fined and not allowed to continue until you have one. Electronic charts are smarter than paper charts. You have to select the object (bridge/marina etc.) and select to display the object properties. In normal view, this info is hidden. See the attached photo: this is the Bridge of the America's in Panama in the most basic chart-view available (to hide any info that might be on the chart). I selected to see this objects properties and these tell me it has a clearance of 61 meters (I configured to see heights in meters). Well to put it bluntly, your wrong. Most of the topographical detail( inland features) for taking compass bearings from is missing from the plotter, also shore details such as fresh water supplies in remote areas,( useful in an emergency) certainly isn't on my Cmap. Nor is the coastal View panoramas to assist in visual position fixing. 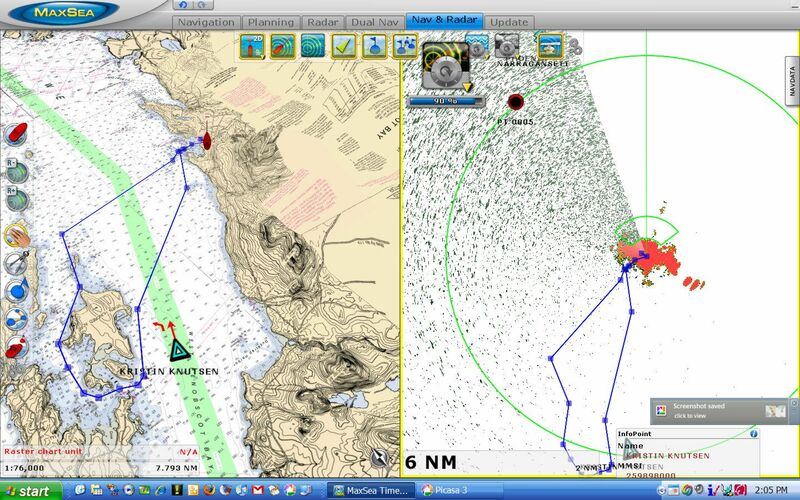 I Have never located the tide meters on my Cmap that are present in table form on my charts either come to think of it. Sure it may be in Pilot guides , but that is not what you stated. Sailing is old world, a world of paper and dividers. Moving slowly under sail exploring the natural world. I always enjoy examining a paper chart that has marks and notes on it. Paper charts have numerous advantages. They are immune to technical failure. In areas that were charted long ago the relative positions of islands, reefs and hazards are generally accurate. On paper it is easy to make notes and observations. A chartplotter in contrast destroys any sense of history or exploration. I suppose chartplotters are for crowded 1st world countries where one does not have the luxury of time to examine a paper chart. It is a world of moving from one place to another as quickly and expediantly as possible expending a minimum of effort. If you expect a 1:1 exact presentation of your paper charts, you should use raster charts that are just like the paper charts but scanned for digital use. As you can see, the 2D chart is even shaped to 3D so that you can see any panorama possible... from looking straight down to looking from sea-level with every angle in between. How is that for panorama and detail? It is still a raster chart with all it's text etc. but just folded to actual 3D presentation plus satellite 3D imagery fused (above water level, you can control the transparency). The data is all there and much more detailed than on paper charts, but you will not find it when you scan the chart for a table. You need to learn how to select objects, push buttons, click with a mouse etc. Tides & currents actually puts paper charts to shame. About compass bearings... you do know that you can take a bearing directly on the plotter? Most will show you the bearing and distance by just hovering the cursor over the land feature and you can simply go outside and check it with compass-equipped binoculars or a hand bearing compass (or the superb Sestrel Moore fixed bearing compass if you have that beauty). As I showed above, all those land features are there on a raster chart or better even using aerial or satellite imagery. About the bridges discussed earlier: you should have a look at the vector charts from the US inland waters (corps of engineers). They provide you with all the details and every view you can dream of, incl. clearance height plus water depth at that point. Even the bridge captains wife phone number is there. So, the problem you have with electronic charts is that you expect them to be exactly the same as a paper chart. That would not allow the improvements so instead you have to learn how to use them, which is different from using paper charts. "Most of the topographical detail( inland features) for taking compass bearings from is missing from the plotter, "
That's totally confusing the issues. That information is not missing from "the plotter" or from electrronic navigation, that information is simply missing from A BAD VENDOR's implementation of it. Electronic charts, just like paper ones, can come from multiple authors and some of those authors are better than others. To call all electronic navigation wrong, or bad, or inferior, because you don't like the way it is authored, is like the fellow who complained so bitterly about the rocks he hit not being shown on his Esso motoring map. After all, it showed the yacht clubs, why not the rocks?! Keep an eye on things like Kindle and e-paper. You may find that within the next ten years, you'll be able to have a 1/4" thick "e-chart" that is 17x22" in size and flips over to recharge itself with a solar array on the backside. And, there will still be better and worse authors supplying the faulty software and poor charting for it. The solution to that, is to complain loudly when the software isn't well made. 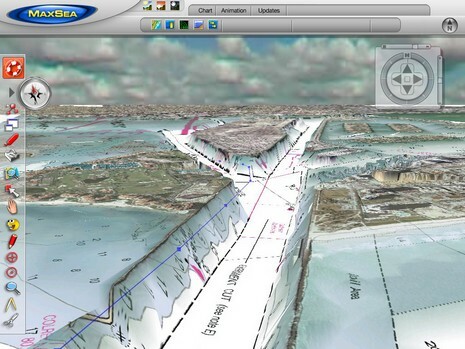 And thank you Nick, for the screen shots of some of the better (and more expensive(G) ) software out there. Also, sailing is timeless, not old world. Since the day men started sailing, we have improved the technology. The paper chart you talk about was one of those improvements, as was the sextant and everything else. If one would follow your logic, we would set sail with a couple of chickens and a skin filled with water. Paper charts have numerous advantages. They are immune to technical failure. So are electronic charts. In fact, they are indestructible. Paper charts are software, not physical. The difference with a paper chart is that our eyes can't see something that is not physically present so we need a device to help us out, like am electronic chart plotter or a computer. If we take that into account we indeed have something physical so we can destroy it. Now, if we throw a bucket of seawater over both a paper chart and am electronic chart plotter, which one does survive? yes, the electronic plotter. I know they invented water proof charts and plastic thingies to put them in; I have used them for ages, but fact is that the plotter doesn't need that protection. So you want to hit it with a bolt of lightning? Yes, that will destroy both paper chart and electronic chart plotter. A near hit might destroy the plotter but not the paper chart. Or, like what you meant I think, the plotter might develop a defect. This just shows that everything that is physical can be destroyed. However, with paper charts you would have to carry a complete second set to recover from disaster, while for electronic charts I only need another gadget that can be as small as a credit card (iPod/iPhone) and I am in business again. If I take a spare laptop I can have a full backup of every chart of the world... which would sink the boat in paper form. In areas that were charted long ago the relative positions of islands, reefs and hazards are generally accurate. Agreed. But you implicate that this isn't accurate on electronic charts? It wouldn't be an advantage otherwise. No, I can assure you that electronic charts are at least as accurate as paper charts. On paper it is easy to make notes and observations. True, and so it is on electronic charts; the difference is the tool. You might choose a pencil for a paper chart while I choose a mouse or keyboard for my electronic chart. Both disciplines must be learned and for most people, typing on a keyboard is as easy as writing on paper. Oh my, now we get into tricky territory ;-) I will counter that with this: A paper chart destroys any sense of history or exploration. True explorers didn't have that gadget, they created it while exploring! Users of paper charts are no real sailors, utterly spoiled by modern gadgets that are not needed at all as proven by us true explorers and sailors! Yes, that sounds very much like nostalgia, I think it is. While I agree with that mood and a big reason for me to leave the 1st world is to step out of that rat race. But the harsh reality is that chart plotters are used by every ship regardless of where they are or where they are registered. A hundred years from now there will be some very old salts in the harbor pubs telling the sailors there this story about how they remember paper charts. How one needed to read a position from a monochrome LCD display (explaining what that was) and use a pencil (explaining what a pencil was) to draw that position on those paper charts. And all the sailors will listen with glistering eyes and buy the old salt another drink before heading out to sea again and using their heads-up navigation displays while their computers tack their boats upwind at a VMG of 30 knots, sometimes pinking a tear from their not so salty eyes when they dream about those long gone days of paper navigation. The inescapable fact is that paper charts will die out. The increasing use of ECDIS is killing it commercially. And the very low cost of leisure plotter is killing it for personal users. That's what is killing paper. Cost. I pay in this part of the world about 40 dollars for a single chart. To properly cover my "local" sailing area requires about 50 charts for all ports and areas. That's 2000 dollars then I have to keep them updated. The equivalent electronic charts are 250 dollars. To cover the med requires nearly 1000 chart all at about 40 dollars yet electronic charts for the same area cost about 1000 dollars. That's what bringing the end to paper. I carry paper planning charts etc and I can use a sextant but my day to day sailing relies on chartplotters as does almost everyone I met. No ones disputes the tactile and cerebral attractions of paper but it's not were the money going. The fact is that with aid were likely to loose physical aids to nav on the next 20 years. Already lighthouses are being downgraded. The march of progress I'm afraid can't be halted. Also the widespread use of gps and plotter has ony view contributed to the overall safety of the sport not detracted from it. There's a fallacy in your argument Nick. If your chartplotter stores your charts on hard drive it is constantly degrading. Hard drives operate in a continuous failure mode, if you like. One of the jobs of the hard drive controller is to identify bad sectors and avoid them through a system of checksums. The system to make it look like everything is ok is very sophisticated but it will fail someday. Flash storage will fail even sooner. CD's suffer disc rot and the marine environment is not an ideal storage environment. They might outlast us ... who knows. Firstly flash memory has a life well beyond your own once you control the number of write cycles. Second just carry a spare map chip. Much cheaper then duplicating your paper charts. Interesting thoses of you navigating soley by paper. What do you carry as backup?? The fact is that with aid were likely to loose physical aids to nav on the next 20 years. Already lighthouses are being downgraded. Then it will be just like exploring in the past. Just turn off the plotter and be instantly in the past. And they said time machines could not be built. As Hellosailor was alluding to, you get what you pay for. The program i use uses Vector charts that is approved for ECDIS under IMO guidelines and as such (as a minimum) MUST include all the information included on approved paper charts, that includes all charted land based structures used for navigation. Some of the so called Chartplotters i see on the market these days i personally think are more of a danger than an aid, and i think people contemplating serious cruising need to do there homework as to which best suits them. Admitedly mine is at the higher end of the price scale, but i trust it over some of the stuff being peddled these days, due to the build requirements of it. I suppose if you are sailing where everything is nailed down on a chart plotter you would be following waypoints and not looking at the water. That would limit one to sail only where up to date charts are available for. What happens when there are no up to date charts. Does one navigate by eye and a chart based on soundings from a century or more ago. Or because one has not built up the skills to navigate by eye and an old chart not go at all. I suppose that would be okay as the places where no modern accurate electronic charts exist would be uncrowded and as such where I would want to explore. I navigate on paper charts. There is no need for a backup. It was suggested earlier in this thread that paper charts will somehow fall apart with a slop of water while an electronic chart would survive. I find that very curious as after 19,000 nautical miles I have never lost a paper chart to water. They are failsafe, no fuse required. I print my own charts at the scale I desire from electronic charts (usually 1/2 scale) in color at a fraction of the cost of store bought charts. One could say my backup is electronic. I have met a lot of people who do not know the basics of navigation and as such are limited as where they feel comfortable going. If it isn't accurately charted it does not exist. I would create a waypoint with a click of my mouse and you draw a small X with your pencil. But we would both be sailing towards a waypoint and we would both be looking at the water. And as our charts are the same and updated the same, they help equally for our navigation. But something changed here... instead of stating that electronic charts are bad because crucial information is missing, you now state that they have too much information and that makes the users not look at the water anymore. That's a 180 degree turn but nonetheless with the same negative view of electronic charts and their users. But you really do know that all good navigators look at the water and that all professional navigators, as well as the majority of serious private sailors, took all the courses to learn the trade and sailed and navigated for a long time using electronic charts. Yes, this proves you really don't understand electronic charts, so let me give an example: the Turks & Caicos. There are no accurate charts for that area. Your paper chart will be based on soundings from a century or more ago, and my electronic chart will be based on soundings from a century or more ago. Hey, it turns out we have the same chart! Next part is about navigation skills. Do you seriously state that navigators that use electronic charts have less skill than those who use paper charts? I would find that a bit insulting even and so would every merchant officer! By now you must realize that there are no users of paper charts on commercial ships anymore because they all use ECDIS. Every paper chart has been digitized. Even if you would manage to come up with a piece of paper showing a chart of some secret cove, I could scan and calibrate it and have it on screen and distribute it worldwide by posting it here before you could count to ten. The digital revolution has happened already. We sail in the same area, so call out a place here, any place, and I will show you the electronic chart I have for it so that you can compare it with your paper version.